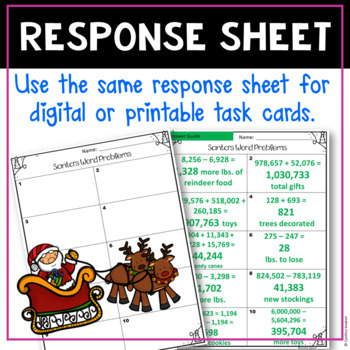 Christmas Digital Task Cards for Addition and Subtraction Word Problems is a digital activity created to be used with Google Slides and compatible programs such as Google Classroom. See the preview for complete details of this product. 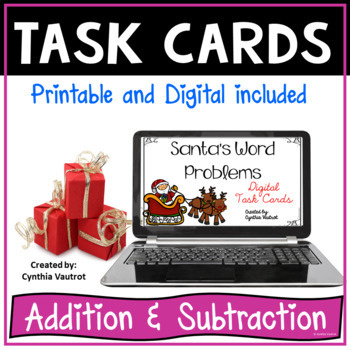 This set of Digital Task Cards focuses on Addition & Subtraction in Word Problems. This interactive digital resource will keep your students actively engaged in your Google Classroom as they complete digital task cards during the month of December. 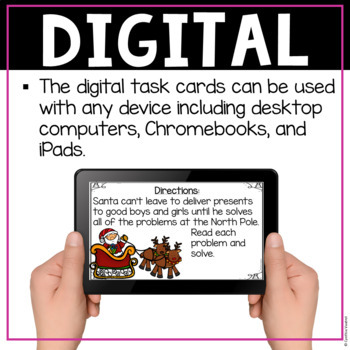 Students will answer each digital task card slide by writing the answers on the included response sheet. The response sheet has an answer guide for ease of grading for the teacher or post in the classroom for students to do self-grading. When uploading this product in Google Classroom, choose "students can view". This is the perfect resource to keep on hand for centers, small group work, morning work or as an assessment. The best part is that it is NO PREP! Just upload to Google Classroom, print the response sheet, and the students are ready to start learning! This product can also be used as a review. Simply use with your big screen and projector system. Use present mode and advance through each slide as a review/teaching activity. If you love beautiful task cards, but don't like using all of that colored ink, then digital task cards are the perfect solution for you! My students were very successful with digital task cards. I hope your students will enjoy also. Check out all of my digital products. Click here. 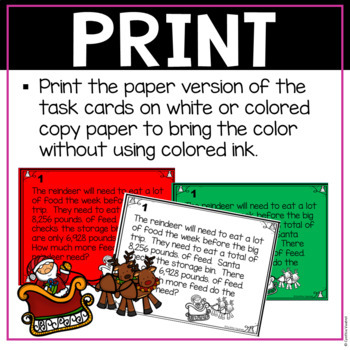 See all of my DECEMBER activities to keep your students engaged and learning during this busy and crazy season. It pays to follow me. All of my products are 50% off for the first 48 hours. Just click "follow me" at the top of the page. I love feedback. It is so important to my store. I appreciate you leaving feedback on this product when you purchase.